My visit was great, the staff there was very nice and had me in and out within 30 minutes. Dr. Radloffwas very fast when she prescribed me a treatment regimen and did not spend more than 2 minutes with me — the nurse was the one who I spent most of my time with. I wish I could have had a more in-depth conversation with Dr. Radloff for how much I paid to see her. My visit was great, the staff there was very nice and had me in and out within 30 minutes. Dr. Radloff was very fast when she prescribed me a treatment regimenand did not spend more than 2 minutes with me — the nurse was the one who I spent most of my time with. I wish I could have had a more in-depth conversation with Dr. Radloff for how much I paid to see her. Dr. Radloff and her staff are extremely kind, I felt very comfortable during my visit and felt that she genuinely caredabout helping me resolve my condition. Would highly recommend! Completed her residency in dermatology at the University Of Kansas Medical Center. 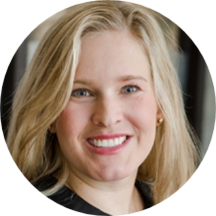 She is a Board Certified Dermatologist and has been affiliated with the American Academy of Dermatology since 2011. In her residency, she was the recipient of both the Advanced Resident Training & Education and the Cosmetic Surgery Forum Grants. In medical school she received her Alpha Omega Alpha membership as well as her Hobart Amory Hare Medical Honor Society membership. During her time in Kansas City, Dr. Radloff volunteered her time to the Midwest Cancer Alliance: Outreach Division by performing skin cancer screenings in underserved, rural regions of Kansas and Missouri. Cetirizine-induced Acute Generalized Exanthematous Pustulosis: a serious reaction to a commonly used drug. Badawi, A. H.,Tefft, K.,Fraga, G. R.,Liu, D. Y.; Dermatol. Online J.. 2014 May 24. Syringocystadenocarcinoma papilliferum: a rare tumor with a favorable prognosis. Peterson, J.,Tefft, K.,Blackmon, J.,Rajpara, A.,Fraga, G.; Dermatol. Online J.. 2013. So nice from check in to checkout. Great doctor and staff. Put me at ease, professional, kind staff, clean and new office. She was professional and on time. She was very professional and knowledgable. I so appreciated Dr. Radloff's calm, cheerful, and informative bedside manner. She took the time to listen to my concerns and help me with my fears/worries. I will be going to see her for my dermatological care from here on out.I trust her to be vigilant and proactive. She's awesome! Dr. Radloff is wonderful. She is professional but compassionate and understanding. She also takes a no nonsense approach for Skin Cancer scans and is very thorough. She found pre-cancerous spots that my last dermatologist had missed, and resolved them. Dr. Radloff made the visit very pleasant. She made me feel comfortable with a somewhat uncomfortable situation. I was extremely uncomfortable going into my full body check after a BCC diagnosis. However, Dr. Radloff was completely professional and explained every stop along the way. I highly recommend her. She is thorough and careful with an engaging and fun personality. I'll be back for sure. I love Dr. Radloff as well as the rest of my family. She always takes her time, never in any rush to answer questions (even if she has other patients waiting) and is extremely knowledgable in her field--and she's incredibly nice as well. Dr. Radloff is amazing. She makes me feel so comfortable and has an excellent personality. I see her for a variety of different things, like annual skin checks and I had some dark spots on my skin. She is very knowledgable and I would recommend her to anyone. Dr. Radloff was very personable and made me feel at ease. I would highly recommend her and her staff. Excellent experience! She is one of the better doctors I've ever had. I can't recommend her highly enough. Love her! I have recommended her to so many of my friends! My friends that see her love her as much as I do! Thank you for everything! I was very pleased and liked her a lot. If you can enjoy a doctor's visit, I was quite pleased with my visit today with Dr. Radloff. She explain the condition that I have and alleviated any fears or concerns that I had. Dr. Radloff is very caring, professional, friendly and listens well to hear patient concerns. I would gladly recommend her to friends or family. Dr. Radloff was very thorough in her exam. She was very professional, and also personable. This was my first time meeting her, and I was very impressed with her. Dr. Radloff is wonderful. Very professional and with a great bedside manner. Highly recommend her. Very thorough, She is always to the point. Which I like. Dr. Radloff impresses me as very knowledgable about cancer screen and asks aboout other skin conditions she observes. Very thorough! She is calm and seems unhurried. Light-hearted. She was fun and friendly, but always in command. I told her I didn't want a "witch-hunt" on my body. Her response was: "Don't you want to find the witches??" She biopsied the one spot I was concerned with, butended up freezing 3 other spots. Well done, Dr. Radloff! Very professional but made me feel at ease right away! I thought Dr.Radloff was awesome! She was energetic and knowledgeable. If was a great experience and I look forward to seeing her again. She's very bright and nice! Although I do not how well the treatment will work yet, she appears to be a wonderful doctor. Was very easy talk to and she listened to what I had to say. Did a thorough exam regarding my health issues andtalked about the various causes. She seemed very caring and wanting to make sure I was cared for properly. I have no complaints and was one of the best doctors visit I have had. DR. kimberly, Very educated, great manner, wonderful bedside mabners. Explained everything she was going to do and why. Frost doctor I have liked in many years.